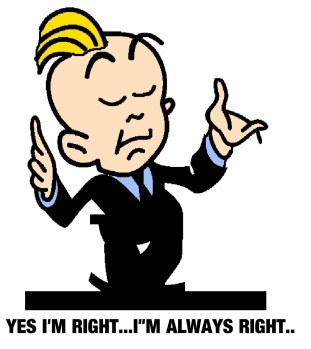 Adults Are Always Right: No Way! They think of us as being lazy, and irresponsible, selfish and useless. Some adults quiver when they hear how we will one day run this world. What makes us lazy, the fact that we watch an hour of television after a hard day at school, before eating dinner and doing our homework? Why are we irresponsible, because we don’t have time to walk the dog due to us studying for our upcoming exam? We’re selfish because we want peace and quite for when we study? And useless because we can’t run any errands for them when we’re taking that one hour out of our day to relax. They do, do a lot and I respect them and all, but give us some credit for a change. Is it our fault that almost every house has at least one television bigger than 22″ and that basic cable comes with at least thirty channels? They keep telling us their stories about when they were kids, and it always has to do with something we can’t help. Like we really want to hear about their pet dinosaurs, and what they had and never had. It’s fun to hear how adults can over-exaggerate and all but what can we do about technology? Is it our fault it exists? They don’t understand how times have changed, and how kids are growing up in this, the modern world. They grow up with music, and sports, and fast cars. Adults criticize these kids. Just the other day I was at the mall and two Greek women were talking about how I looked and what kind of person I must be (in Greek of course,) not knowing I myself was Greek. I turned to them and translated ‘never judge a book by its cover’ in their language. The expressions on their faces would have made a great Kodak(c) moment, however I don’t think my camera catches the particular shade of red that was expressed on their faces. They think it’s easy to look the way we do, but we take pride in our ‘grooming’ ourselves. This goes to show how times have changed. Kids no longer wear uniforms to public school anymore. We have the freedom to wear what we want. However, is it our looks that make adults think we’re irresponsible and lack values? There are the few that look odd, act odd, and . . . well . . . are odd, but do those few speak for the rest of us? All kids ask for, is to be treated like they deserve to be treated. How will putting them down and insulting them, make them feel better about themselves and their surroundings? There are many intelligent minds out there that have yet to be discovered. Teachers look at a lot of these kids and think of them as being punks and like to pick on them because they don’t pay as much attention in class, as the rest of the students. They don’t spend as much time with these kids because they think that they’re going to grow up and be nobodies in life. What they look at as fooling around and not paying attention, is really lack of interest. Lack of interest because the class is too boring. To open up these minds classes have to have more life in them. I mean, who wants to be in a classroom for an hour and listen to a sustained, monotonous voice speak rather slowly as they take notes? I mean no offense to those teachers, but put yourself in that position and contemplate how it may feel. This seems like laziness to learn. Laziness, leads to selfishness, which leads to dishonesty, which leads to lack of values. It is true that many kids are lazy for no apparent reason, and that they do have better things to do with their time. And instead of putting them down and saying, “Hey Paul, why don’t ya get up and do something instead of watching that damn T.V. all the time.” They can try to include kids in their activities, or reward them for what they have done. The better the job done, the larger the reward. This way kids are encouraged to do something around the house. The last point I would like to make is that kids want to be heard. A good example here is when it was time to go school shopping. Two weeks before school started my father told me to write a list of everything I needed and that upcoming weekend we would go and get everything. The weekend passed and I had not yet gone. I asked again the next day when he had returned from work and he told me, “you never said anything about going school shopping. You have to wait till next weekend now.” Having my older brother and mother witnesses to both of these encounters, they told him how I already said I wanted to go school shopping. He changed the subject and continued another conversation. Now I’m sure I could have reminded him that weekend, rather than just writing a list and giving it to him, he’s a busy man, but the fact that he couldn’t even remember me telling him about it really got to me. And that is why I say kids want to be heard. I’m sure many things that kids say are senseless and better off unheard however there are those intelligent minds out there that can actually say something, worth saying. And it is those kids that should be listened to. To conclude I would like to say that kids shouldn’t blame adults for looking at people and criticizing. I mean even kids criticize other kids and adults, however the feeling is different when you are called dumb by a classmate, and called dumb from your teacher. But to tell you the truth I don’t think kids should really care about what others say when they criticize. Oh, okay. Shall have a look at it. Thank you so much. Hope to see you more here. Talk With Parents, Yeah Sure!